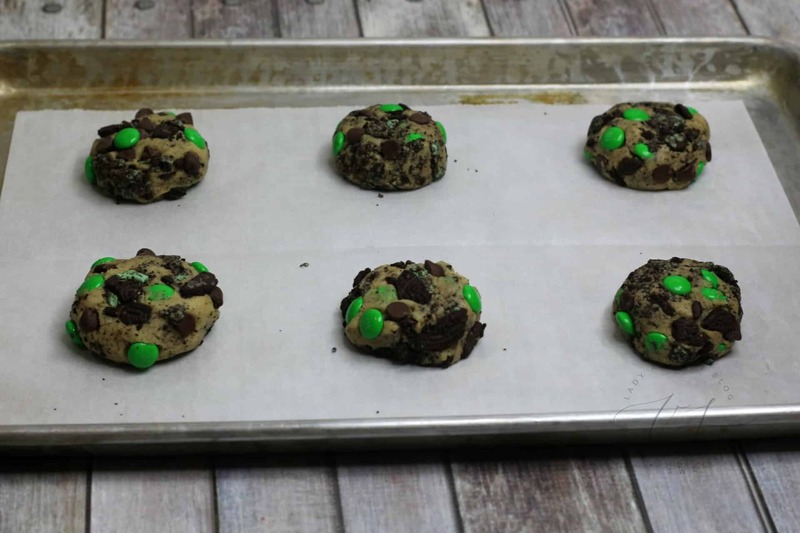 This Mint Chocolate Chip Cookies Recipe is an explosion of all your favorite flavors – all in one bite. I challenge you to take a nibble into one of these cookies and see if you can get a crunch without any extra goodness tossed in. They are saturated with chocolate madness and if you are a dessert lover, you will be ALL IN! 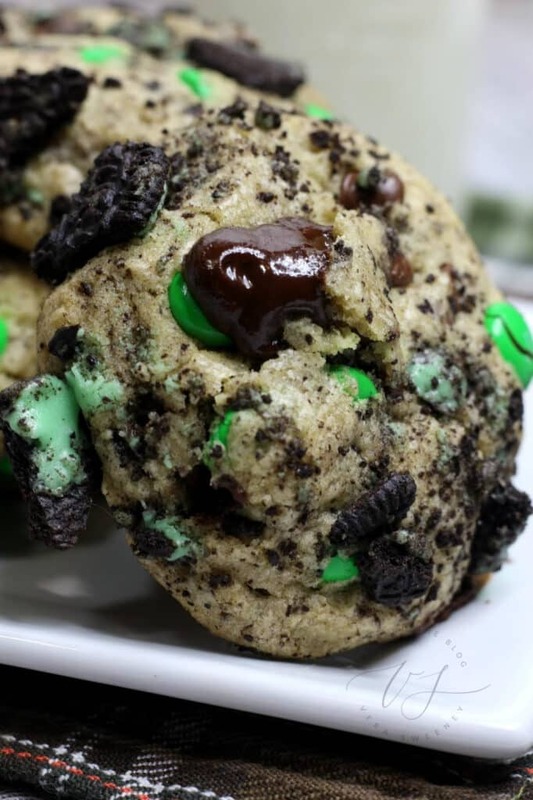 This batch mixes Oreos and melted chocolate with your traditional cookie ingredients. The surprising combination profile will have your family and friends asking for seconds. I have to admit, I am a bit of a traditionist. Give me an ordinary chocolate chip cookie any day of the week. In fact, I literally just made some this week – the standard way. But that doesn’t mean I don’t like having a special recipe up my sleeve and Oreo recipes are always special. 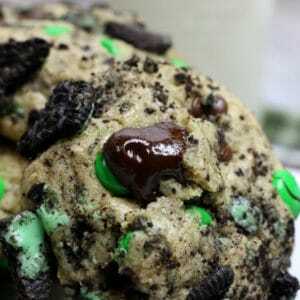 When you mix Oreos with anything, they add that extra layer of fun that we all are looking for, right? 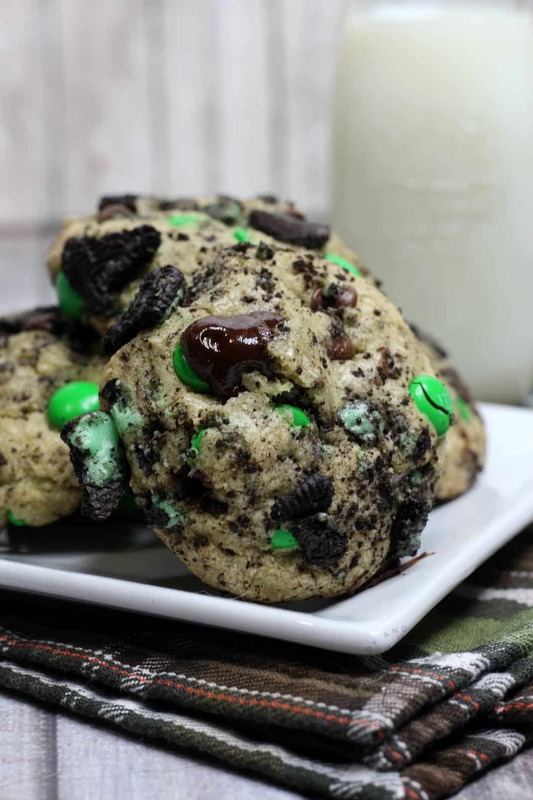 This Oreo cookie recipe promises to satisfy! This Oreo dessert recipe makes 22 large cookies. If you need to make more or less, just adjust the measurements as needed. In a small bowl combine flour, baking soda, and salt. Set aside. 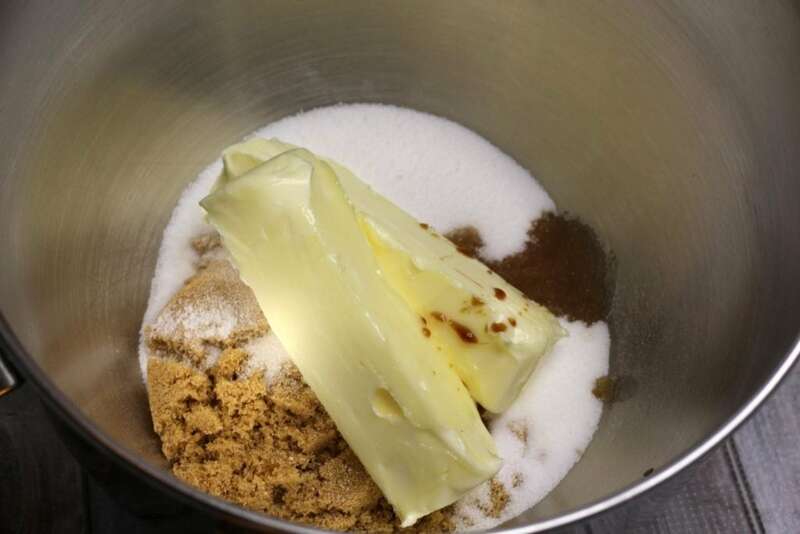 In a standing mixer, beat together the butter and sugars until combined and fluffy. Then, beat in the egg and the vanilla. Gradually beat in the dry ingredients until fully combined. This Oreo dessert recipe requires you to add in the ingredients a bit at a time. 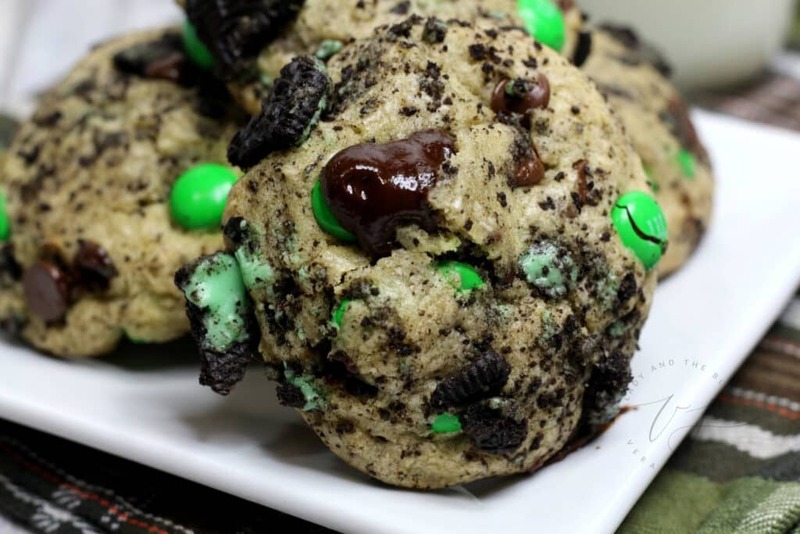 Fold in 1/2 C green M&M’s, 3/4 C chocolate chips, 1/2 of the chopped Oreos and 1/2 of the crushed Oreos. Using a medium ice cream scooper, scoop some cookie dough into your hands and roll it into a ball. Mold your cookie. Meanwhile, combine the remaining M&M’s, chopped Oreos and crushed Oreos into a bowl and mix until combined. Roll cookie dough into the mixture and place onto the cookie sheet. Lightly press down onto the cookies into a thick disk. Bake in the oven – 1 tray at a time – for about 10-12 minutes or until lightly golden brown. My oven isn’t so great, so I always have to keep an eye on my cookies. Sometimes I need LESS time. So, keep watching them. In a small saucepan, heat up the heavy whipping cream until simmering. Pour chocolate chips into a heat safe glass bowl. Once the heavy whipping cream is simmering, pour into the chocolate chips and allow to sit for 1 minute before whisking until smooth. Using the flavor injector, place the needle into the bowl and pull the knob up on the injector to pull up some chocolate ganache. Poke the side of the cookie and inject ganache into the cookie until the top cracks. Repeat steps on all the remaining cookies. 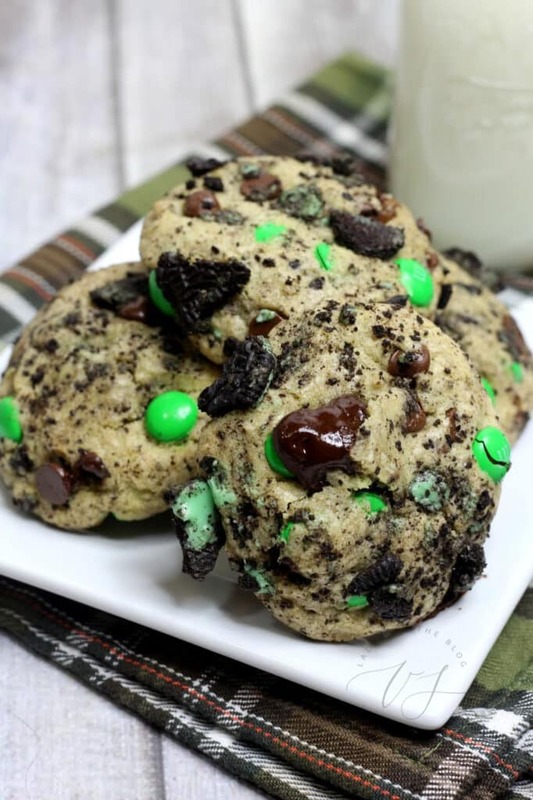 What do you think about this Mint Chocolate Chip Cookies Recipe? Something you are willing to try? Looking for other delicious desserts?